Information Week put out a great article on common iPad/Apps issues in the workplace and how to solve them. I can’t print from my iPad! I can’t read PDFs! I can’t view PowerPoint presentations! Have you uttered any of these phrases yourself–or heard them in the office? Apple iPad annoyances don’t just steal user time anymore. They steal IT’s time. A recent study by Forrester Research confirms a trend that was hard to miss during the past two years: People are bringing their personal iPads to work. And the iPad-at-work phenomenon is part of a larger trend, the Apple-ification of the enterprise. In fact, 21% of information workers worldwide now use one or more Apple products for work, according to Forrester. Macs and iPhones are popular, naturally, but the iPad has found its niche in the business world, particularly among executives. “Of course, the iPad added to this phenomena, which is visible when you walk down the aisle of long-haul flights in the U.S.–there are lots of iPads, especially in first class,” writes Forrester analyst Frank Gillett in a recent blog post. So corner-office residents, younger workers, and highly-paid staff all love their iPads, the Forrester study shows. But if Apple’s slate–and the tablet in general–is to become ubiquitous across multiple industries, enhancements are necessary. A recent survey of 100 healthcare IT managers by BizTechReports, a research firm, and Panasonic shows that “consumer-grade” tablets like the iPad create new challenges for the health industry, including security issues involving patients’ privacy and personal information. “The results of the survey reveal that consumerization in general–and the launch of the Apple’s iPad in particular–has created a conundrum for healthcare CIOs and their IT departments. Pressure to adopt and integrate these technologies is driven by the fact that customer service and end-user satisfaction is an increasingly important metric against which the success or failure of technology organizations are measured,” the report states. The iPad invasion at work brings usability issues that can impact IT departments. For instance, if iPad-toting workers can’t open PDFs or Microsoft Office files on their tablets, they may seek assistance from busy IT staffers. Luckily, there are several easy and cheap software applications, including Good.iWare’s GoodReader, that enhance the iPad’s weak file-viewing capabilities. And another app, SlideShark, allows iPad users to view and show PowerPoint presentations. Enterprises must prepare for iPads and other tablets, obviously, and the time to do so is now. Here are 10 iPad annoyances that you can easily remedy with some simple–but not always inexpensive–software and hardware enhancements. Did you know an iPad can grow an arm, so you can use it without holding it? 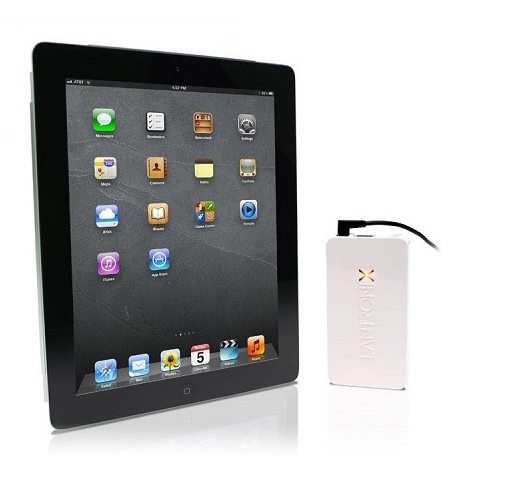 Or that you can charge multiple iPads from one charger? Check out our list of common problems and solutions. We’ve even cracked the printing problem. Problem: You can’t dictate notes to your iPad. Solution: Nuance Communication’s PaperPort Notes is a note-taking app for the iPad with something extra: speech recognition. 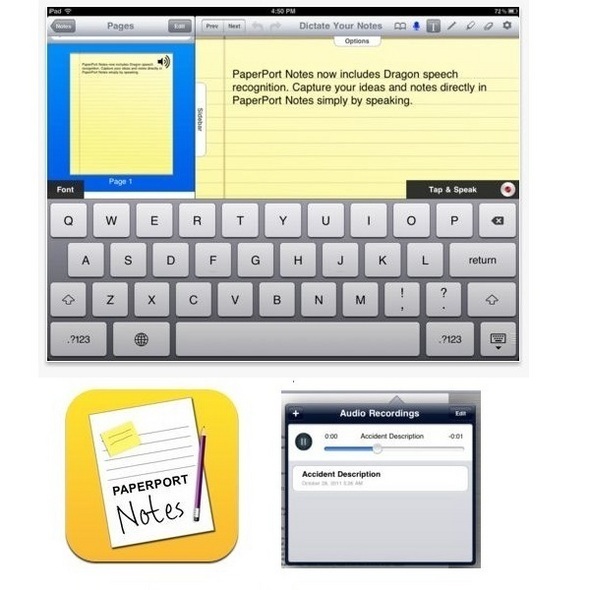 Version 1.1 offers a variety of ways to take notes, including typing, writing, drawing, importing files from cloud services, and pasting data from the iPad’s clipboard. But for dictation devotees, the app’s new Dragon speech-to-text feature is an essential tool. When you touch PaperPort Notes’ Tap & Speak button and start speaking, the app is listening. Tap the button again, and PaperPort turns your spoken words into text. Even better, the app is free in the iTunes Store. 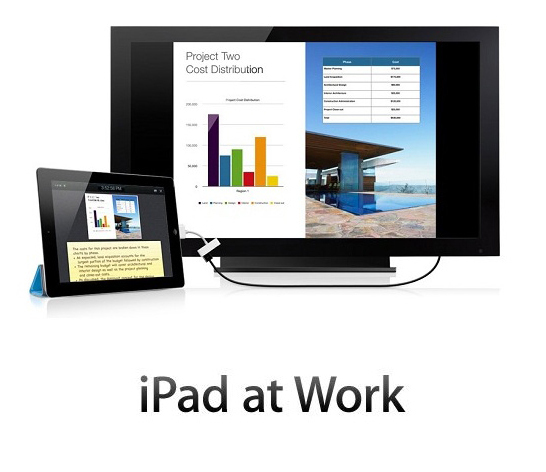 Problem: How do you view PowerPoint presentations on your iPad? Solution: SlideShark is free iPad app that makes it easy to watch PowerPoint slides. You upload a PowerPoint presentation to your secure SlideShark account, where the file is automatically converted to an iPad-friendly format. Using the SlideShark app, you can then download and view the presentation on your iPad. Enterprise users should consider SlideShark Team Edition, which costs $149 per year and includes 5 GB of cloud storage, as well as the ability to add, delete, and manage users, and share access to files. The free version comes with 100 MB of storage. SlideShark Plus 500 MB is $49 per year, and SlideShark Plus 1 GB is $98 annually. Problem: Help! My business has multiple iPads. What’s the fastest, most convenient way to charge and sync them all? 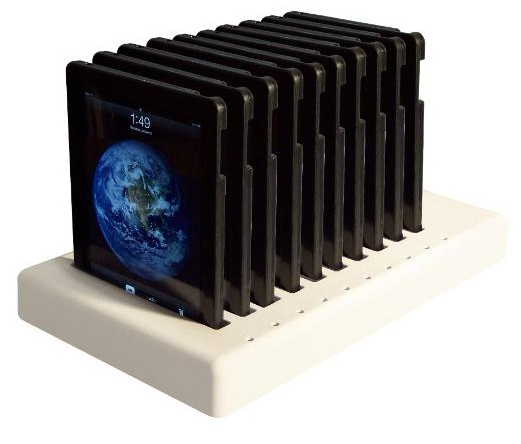 Solution: Parat Solutions’ ParaSync is a $1,000 charging station that holds up to 10 iPads at once. Scheduled to ship in late March, ParaSync eliminates the need for unsightly wires and manual cable connections. It’s convenient for schools, museums, health care providers, and other operations that need to keep multiple iPads charged every day. LEDs indicate when the devices are charging and syncing, and when they’re fully powered. ParaSync includes 10 cases, which hold the iPads during the charging/syncing process. The docking station connects via USB to a Mac or PC. If you need to power up even more iPads, consider the Anthro Charging Cart & Cabinet for Tablets, which can recharge up to forty iPads or Android slates. Problem: How to view PDFs on an iPad. Solution: Using an iPad in lieu of a laptop is convenient when you’re on a business trip or stuck in endless meetings. There’s one problem, though: The iPad doesn’t have a built-in reader for PDF files, unless you’re viewing PDFs in Mail or Safari. Good.iWare’s GoodReader for iPad to the rescue! 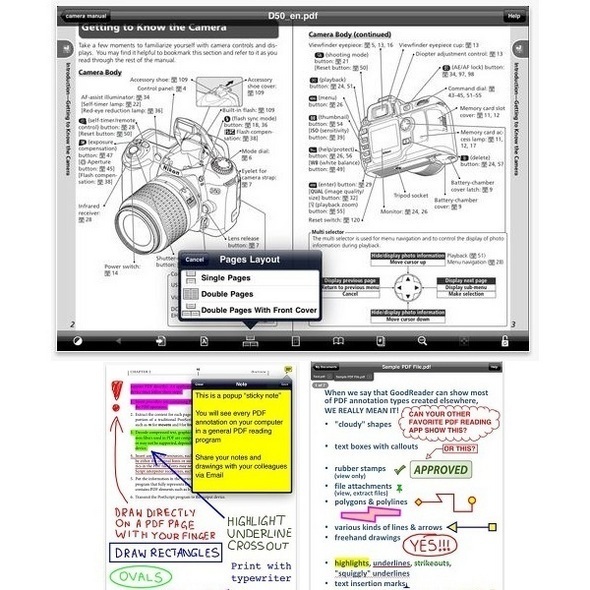 This $5 app is adept at handling gigantic PDF files larger than 100 MB, including manuals, renderings, and magazines. It also supports MS Office formats, including .doc, .ppt., and .xls. For a more enterprise-friendly option, check out Nexus from ionGrid, a server-and-app combo with built-in viewers for PDFs and Office files. Nexus streams secure documents from your company server to employees’ iPads. Problem: I can’t–or don’t want to–hold my iPad while I work. But I need it close by. Solution: TwelveSouth’s HoverBar is a flexible arm accessory that works in two ways. 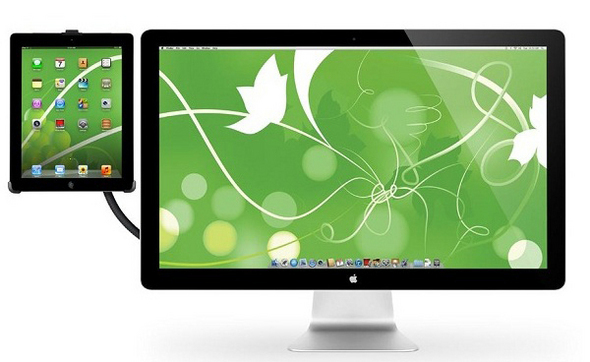 It connects your Mac to your iPad, allowing the latter to function as a secondary, touch-screen computer. Alternatively, the HoverBar clamps to a cabinet, allowing your iPad to “float” above a workspace–near enough to reach out and touch, but not too close to get in the way. Indeed, professional (and amateur) chefs in messy kitchens could put the HoverBar to good use. Priced at $80, HoverBar fits the iPad 2. Problem: My iPad won’t print to the networked printers in my office. Solution: When Apple designed the iPad, it gave short shrift to printing concerns, particularly in business environments. Thankfully, there are products such as Lantronix’ xPrintServer, which allows iPads print wirelessly to any printer on the office network. This $150 device is simple to set up, and connects to your network via Ethernet cable. Problem: My iPad won’t connect to an 802.11n Wi-Fi network. Solution: If your iPad can’t connect to Wi-Fi, and you’re using a third-party router (i.e., not Apple Airport), the culprit may your 802.11n router’s Wireless Multimedia (WMM) setting. If WMM is disabled, the iPad won’t find the network. 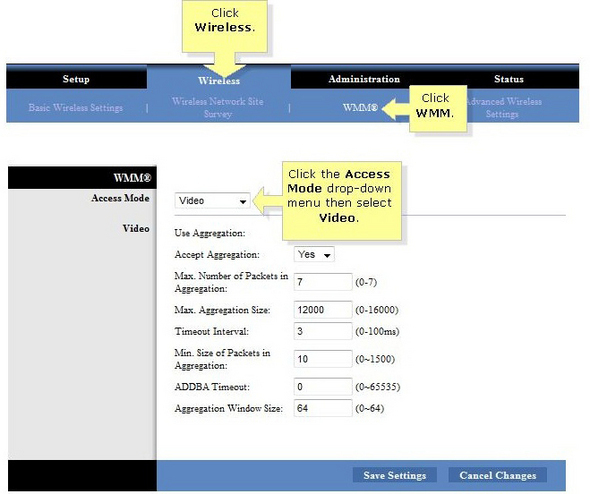 Delve inside your router’s settings to make sure WMM is enabled. A variety of materials in the home and office may absorb or reflect RF signals, a potential problem for Bluetooth and Wi-Fi devices. These include concrete, bullet-proof glass, and metal, according to Apple’s support site, which has a variety of tips on how to minimize wireless interference. Problem: I’m not a fan of Mobile Safari. What are my options? Solution: Good news! There are many alternative iPad browsers in the App Store, including Atomic Web Browser, iCab Mobile, and Mercury Web Browser Pro. 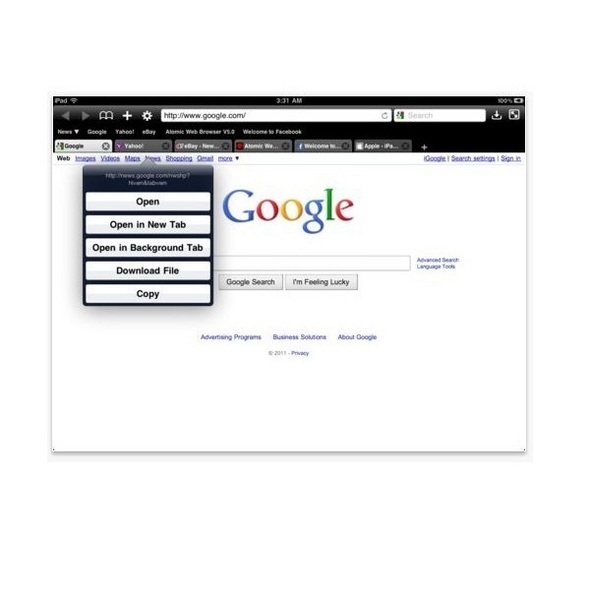 These browsers are inexpensive, ranging from 99 cents to $1.99, and are highly customizable. They also support essential features such as a full-screen mode, tabs for opening multiple Web pages at the same time, and Dropbox file transfers. Problem: Apple is famous (or infamous) for locking down its hardware. With the iPad, the storage you bought initially–16 GB, 32 GB, or 64 GB–is all you’re ever going to have, since the tablet lacks a memory expansion slot. And while Apple’s iCloud is available as additional closet space, what if you need local, portable storage? 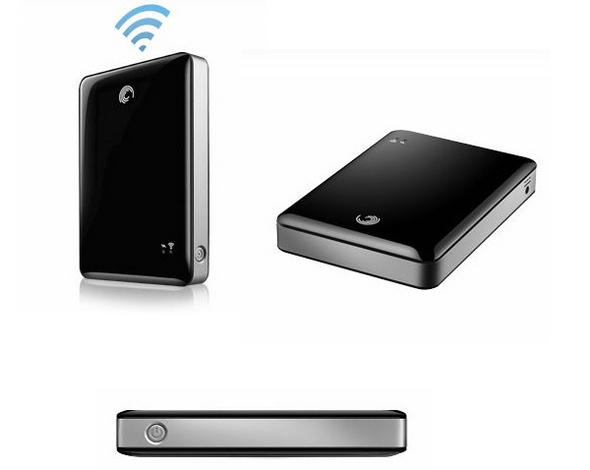 Solution: Seagate’s GoFlex Satellite Mobile Wireless Storage is a battery-powered, 500 GB hard drive that streams documents, HD video, and other content to up to three mobile devices simultaneously via 802.11 b/g/n Wi-Fi. Priced at $200, GoFlex offers up to 5 hours of battery life, and 25 hours of standby time, says Seagate. Problem: Touch input won’t cut it. My work requires a stylus. Solution: The iPad peripherals market is chock full of styluses for writing and drawing. The Adonit Jot Touch Adonit Jot Touch, for instance, is an impressive new entrant in this market. 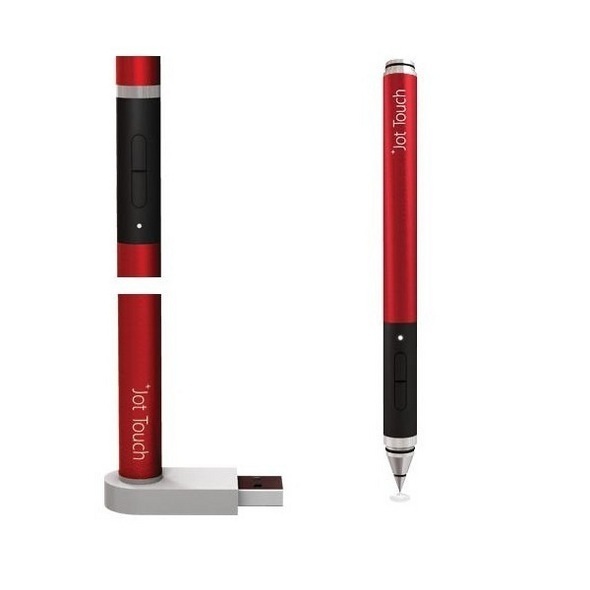 A pressure-sensitive stylus with Bluetooth connectivity, the Jot Touch is a precision tool that ignores your palms if they should accidentally touch the screen as you draw or write. If you’d prefer a stylus that doubles as a ballpoint pen (the stylus and pen are at opposite ends), consider such two-in-one models such as the $25 Kensington Virtuoso Touch or the $40 Targus Executive Stylus & Pen.